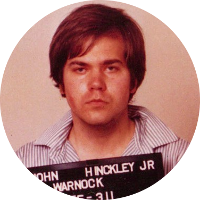 ⇐ Prev Generation | ⇐ John Hinckley, Jr.
10th Generation — 7th Great-grandfather of John Hinckley, Jr.
5 Stonington, CT: First Congregational Church Records, 1674-1874, p. 196, Baptism for son William Wheeler, New England Historic Genealogical Society (Online Database). 6 Gallup Family Assoc., Gallup Genealogy: Gallop, Galloup, Galloupe, Gallupe, Gollop; 2nd Edition, Revised and Expanded, Provo, Utah: Brigham Young University (1987), 11-12. 7 Park, Edwin H., The Park Record: Containing an Account of the Ancestry and Descendants of Thomas Kinnie Park and Robert Park of . . ., Denver, Colorado: Bartow and Ray Print (1902), 12, Heritage Quest (Digital Library). 8 Roberts, Gary Boyd, "#78 Royal Descents, Notable Kin, and Printed Sources: Ten Further Hollywood Figures (or Groups Thereof)", (accessed 10/06/2014), New England Historic Genealogical Society (Online Database). 9 Roberts, Gary Boyd, Notable Kin, Volume 1 , Santa Clarita, California: Carl Boyer, 3rd (1998), 222. 10 Roberts, Gary Boyd and William Addams Reitwiesner, American Ancestors and Cousins of The Princess of Wales, Baltimore: Genealogical Publishing Co., Inc. (1984), 42-43, 55, Ancestry.com (Online Database). 11 Smith, H. Allen, A Genealogical History of the Descendants of the Rev. Nehemiah Smith of New London County, Conn., with Mention of . . ., Albany, New York: Joel Munsell's Sons, Publishers (1889), 71, Google Books (Digital Library).